At Quilt Market, I stopped by the Patchworks Studio booth to meet Canadians Daphne Greig and Susan Purney Mark. Daphne and Susan are well known for their wildly popular books Fat Quarter Frenzy and Fat Quarter Frenzy Two. I found out they’ve also developed a very cool appliqué style they call Give and Take Appliqué. My husband the scientist would call it “figure and ground illusion.” Whatever you call it, it’s really very striking and an idea whose time has come! Visit the Patchworks Studio patterns page to check out Give and Take Appliqué. I traveled to Portland last weekend to attend Quilt Market, the semiannual behemoth trade show for the quilting industry. I had THE most fabulous time. Saw old friends, made new ones, put lots of faces together with names, and learned a ton of new things. I was scouting the appliqué! Over the next couple weeks I’ll be posting interesting nuggets from my trip. First though, I need to introduce my newest design! I got the pattern booklet back from the printer just three days before the trip. Home is filled with symbols of warmth and welcome. As the years go by, I appreciate more and more the simple comforts of home and shelter. 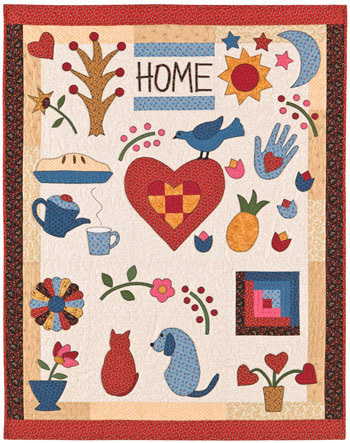 From beloved pets to pie and coffee to the feeling that “home is where the heart is,” this nap-size quilt with its cozy and familiar motifs is my commemoration to the places we make our own. I did have a wonderful trip, but it’s nice to be home :). 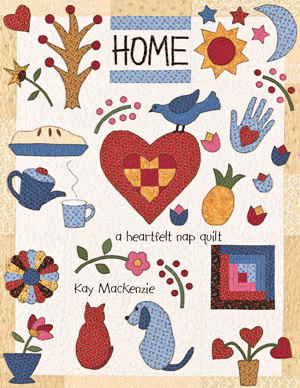 Home is available on the Quilt Puppy website. The 16-page booklet has full-size patterns plus complete construction information. Use any form of appliqué — nothing fancy required! Cathy Van Bruggen Designs is having a wacky and wonderful contest: Guess how many licks it takes Maddie the Dog to finish her favorite treat, a red lollipop. Fun!! (I’m sure Maddie brushes her teeth afterwards.) The prize for the person who guesses best is a fabric pack… I looked it up and it’s a $60 value folks. Click on over to see a video of Maddie in action, and take your best guess! Contest ends May 31 so get right on it. And while you’re there, take a look at all the beautiful appliqué patterns. I found the most fabulous photo tutorial on designer Barbara Brandeburg’s blog. She has posted a wonderful step-by-step visual guide to creating raw-edge fusible appliqué. Hurry over to her blog and look on the righthand sidebar for “Easy Appliqué Tutorial” and have it all laid out before your eyes. While you’re there, read her posts answering questions about appliqué. It’s a treasure trove over there. Thank you Barbara! You can also shop for her highly attractive patterns. Not that long ago, American Patchwork & Quilting magazine launched a companion website called AllPeopleQuilt … APQ, get it? I was intrigued by a mention in the latest print magazine about quilting classes on-line, so I surfed on over to check it out. Two appliqué classes head up their list of offerings. Linda Hohag is demonstrating a starch technique, and Pat Sloan is showing how to she does fusible appliqué. It looks like these are on-demand videos. On the site, there’s also an area called “Try Techniques.” Click on the Appliqué section for gobs of free tips and tricks for a variety of methods.